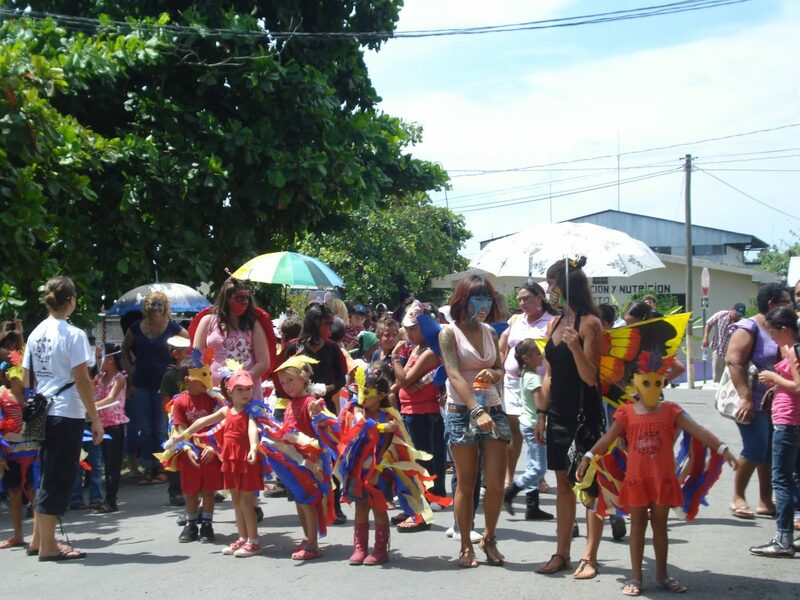 September 18th represented the 3rd Annual Sea Turtle festival on Carate Beach. About 100 members of Carate, Puerto Jiménez, and surrounding communities participated in sea turtle discussions, presentations fun activities with the theme of conservation. The festival began with an interactive discussion with children and adults about the principal biological characteristics of the Osa, the turtle species that nest here, and the objectives and activities of the Sea Turtle Conservation Program developed by Osa Conservation on the beaches of Piro, Pejeperro and Carate. Club Ambiental Las Abejitas of the Saturnino Cedeño School, under Laura Castro’s direction, prepared a theatrical skit for the event about the life of a sea turtle and the natural hazards and human threats that they face as well as the precautions that we must take on the sea turtle nesting beaches. 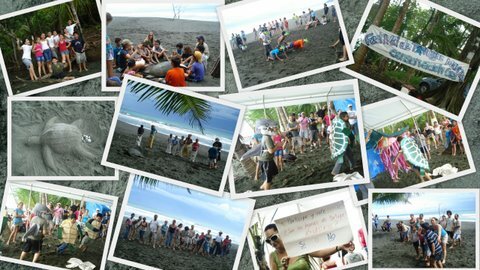 Activities included games on the beach, like turtle races and turtle sand castles, and a quiz competition about Osa’s biodiversity. All participants in the event received informative material about sea turtle conservation, stickers, posters, and t-shirts for those who correctly answered the most questions. Thank you to everyone who helped make this year’s event a success in raising awareness of the importance of conserving these incredible species. 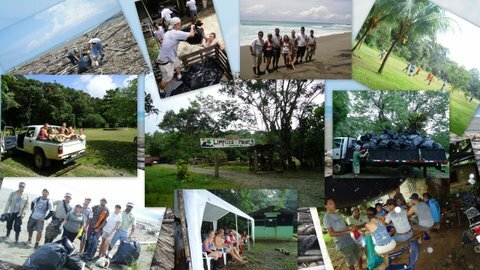 SEEturtles, Luna Lodge, La Leona Lodge, ASCONA, Finca Exótica, Dereck Ferguson, Hacienda Río Oro, the Bellanero family, ACOSA, Tranquility, Frontier, Lapa Rios, Hoja de Osa School, Club Ambiental Las Abejitas, Laura Castro, and Mauricio Gutiérrez. August 7th represented the second Day of Beach Cleaning along sea turtle nesting beaches in Osa. With the participation of around 150 volunteers from the community, local hotels, personnel from Osa Conservation Area, Frontier volunteers and Osa Conservation employees, we were able to collect waste along 12 km of beaches, from Carate to Matapalo. Starting off early in the morning to take advantage of low tide, the groups divided up throughout the area with plastic bags, gloves, sun screen and lots of water. The day of cleaning continued past noon, when the participants came together at the Piro Biological Station to have lunch and end with a soccer game. As with every year, the majority of the waste found on the beaches was plastic bottles and pieces of Styrofoam, which shows us how businesses and consumers still have to work towards being more environmentally responsible. We hope that this clean-up will help the sea turtles in their difficult journey from the sea to the beach and back again, a journey that, although short, implies a great physical effort on their part which they undertake with the goal of conserving their species. Lapa Rios, Bosque del Cabo, El Remanso, the Bellanero family, Hacienda Rio Oro, ISEAMI, Lookout Inn, Finca Exótica, Luna Lodge, La Leona Lodge, ACOSA, FRONTIER, the community and Asdrúbal Cordero. 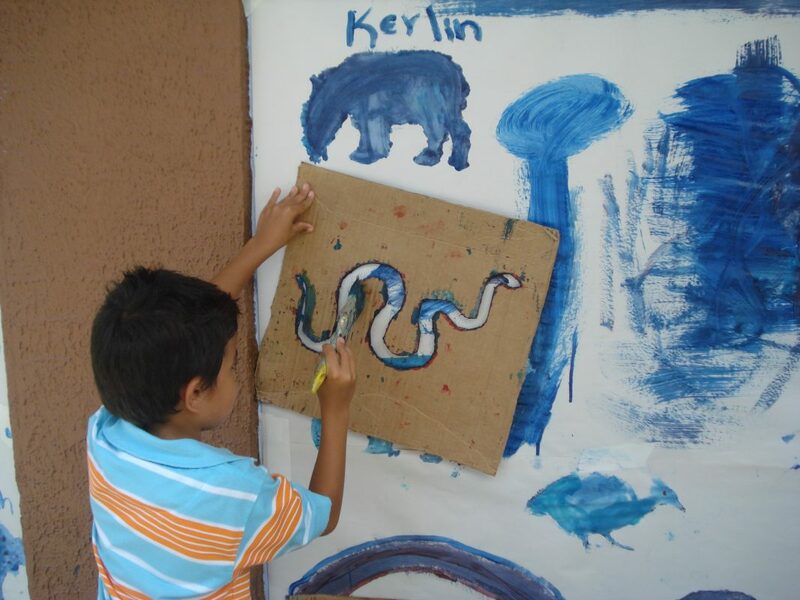 What’s happening with Foo’s Community Environmental Education and Outreach Programs? Check out these exciting programs and events happening in Osa! In celebration of the United Nations International Year of Forests, FOO’s environmental education program began tropical rainforest workshops in April with students and teachers from 13 Osa schools. There was an exciting opening event on Saturday April 30th, with the participation of MINAET and ICE and the collaboration of organizations such as TNC, Neotropica, Yaguara, ACEPESA, Shark Quest, ASCONA and RANA Group. The event featured fun education and recreational activities as well as lectures and presentations of research happening throughout the Osa Peninsula. The celebration will continue in August, September and October with a student reforestation campaign aiming to plant 4,000 native trees along Osa’s deforested stream banks! This year, Friends of the Osa’s environmental education program has partnered with the Central American Association for Economy, Health and Environment (ACEPESA) on a project called “Capacity Building in Coastal Communities of the Golfo Dulce to Improve Sanitary Conditions.” This program serves to educate the communities of La Palma, Guadeloupe, Puerto Escondido, and students and teachers of 10 Osa schools, about the importance of watershed protection and the sustainable management of water resources. Through this program, students will learn about the merits of alternative wastewater management systems, such as bioswales—systems that function as wetlands, catching and treating domestic wastewater naturally to prevent contamination of groundwater, rivers and soil. In July, FOO will again host the annual community beach clean-up! 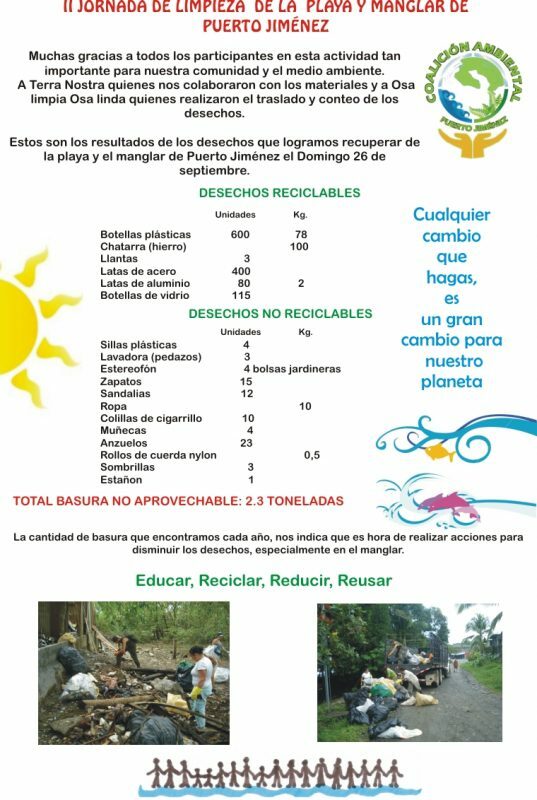 With the support of many Osa community members, we will pick up trash along the sea turtle nesting beaches from Piro to Peje Perro lagoon, as well as along the beaches and mangroves of Puerto Jiménez. Look out for posts and pictures from this amazing yearly event. In the months of October and November, FOO will be hosting sea turtle education workshops at Independence School and Academic College in La Palma. Look out for posts and pictures from these upcoming events. Located in southwestern Costa Rica, the Osa is hailed by many as Costa Rica’s “last frontier” as it remains a largely untouched, remote wilderness. The Osa’s high level of biological diversity coupled with its unique combination of 13 distinct tropical ecosystems have made it a high global conservation priority. With a total area of only 300,000 acres, the Osa is home to 50% of species found in Costa Rica, including many endemic species. When one considers the small size of the Osa, there are few places left on earth that rival its intense biological diversity. It is here one can find the largest intact mangrove ecosystem in Pacific Mesoamerica, the most significant remaining areas of lowland Pacific tropical rainforest, and one of only four tropical fjords on the planet, the Golfo Dulce. These ecosystems, and numerous others, provide habitat that is essential for the Osa’s plentiful wildlife. Tree samples waiting to be process by Greg Asner´s working team, January 2010. Staying here will give you quick access to mature rainforest as well as to the coastal habitat along the Pacific, making this campus ideal for researchers, field biology student groups, and sea turtle volunteers. The Greg Gund Conservation Center is an educational campus located on the Cerro Osa property. Here you have the option to stay in the bunk house or on a camping platform; no matter which you choose, you won’t regret the breathtaking view looking west to Corcovado National Park and the Pacific Ocean. The Cerro Osa property where this campus is located, is a 1,500 acre tract of land that is contiguous with the Piro Research Center property. You can get here either by walking the Cerro Osa trail or by car on the access road. While the Greg Gund Conservation Center isn’t as close to pristine rainforest as the Piro Research Center, the land use history of Cerro Osa makes it an ideal location to study tropical forest regeneration since the forest directly surrounding the campus is recovering plantation. Today SEE Turtles launched its effort to raise money for Friends of the Osa’s annual Sea Turtle Festival. 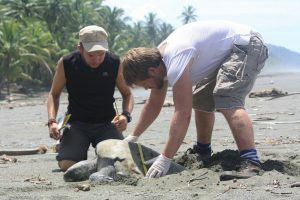 SEE Turtles is a project of the Ocean Foundation that promotes conservation tourism by acting as a resource for travelers to connect with volunteer programs or to donate to organizations protecting sea turtles and educating communities. 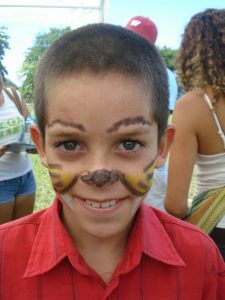 Through the matching fund launched today, you can donate to support FOO’s Sea Turtle Festival in 2011. This past September, Friends of the Osa’s Second Annual Sea Turtle Festival was successful in attracting children and their families to the Osa Peninsula’s Carate Beach to learn about sea turtle species, like Olive Ridleys, Green Turtles, Hawksbills and Leatherbacks. This annual sea turtle festival has been an effective way to develop community interaction and create local understanding about the issue of sea turtle egg poaching. Through activities, presentations, and contests for children, Friends of the Osa not only spreads awareness of our work but we also take preventative action by ensuring people don’t participate in sea turtle disturbance and habitat destruction. SEE Turtles covers administrative costs so that 100% of your donation goes towards our 2011 sea turtle festival that educates the community about sea turtle conservation. The goal of this matching fund is to raise $2,000. Because sea turtle conservation is an important aspect of FOO’s mission to protect the globally significant biodiversity of the Osa Peninsula, Costa Rica, we encourage you to check out the SEE Turtles website to learn more about SEE Turtles and sea turtle conservation beyond the Osa Peninsula. Remember that Friends of the Osa also operates a sea turtle conservation program that is open to volunteers from July to December every year. Volunteer to help save the Osa’s endangered sea turtles! The objective of this project is to contribute to community awareness about the responsible use of water resources and the proper management of wastewater through the construction of bio-boxes as a mechanism for treatment of gray water. Workshop topics are: 1. Water and its importance to human life and ecosystems, 2. Water and watersheds, 3. Mangrove ecosystems, 4. Golfo Dulce ecosystem, 5. Global warming and its impacts, 6. Water and its effect on health and the environment, and 7. Alternative sanitation and rainwater harvesting. This project is relevant to the conservation of the Osa Peninsula’s aquatic resources including rivers, mangroves and the Golfo Dulce, helping to mitigate pollution and deterioration of these vital ecosystems. Find out more about Friends of the Osa and our other conservation work on the Osa Peninsula by visiting our website, or plan a trip to the Osa Biodiversity Center. On September 26th, Friends of the Osa participated in the second annual Puerto Jiménez mangrove and beach cleanup. This activity is part of a global Ocean Conservancy initiative, with Terra Nostra as the Costa Rican organizer and the Puerto Jiménez Environmental Coalition as the local organizer. 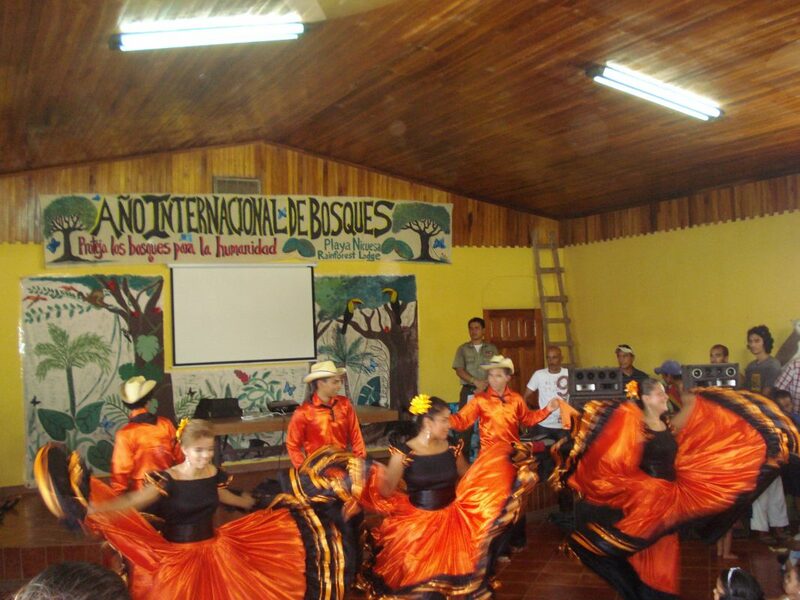 We had around 60 participants, including students, girl scouts, Frontier volunteers, community members, hotel staff from Lapa Rios, Bosque del Cabo, El Remanso and other local organizations such as ASCONA. In total, we cleaned 1.5km of beach and 0.5km of mangrove. Looking at the results presented below, it’s clear that there is a need to reduce the amount of waste. While we already focus on education and community awareness about the responsible management of waste and recycling, it is apparent that more action needs to be taken particularly along the edge of the mangrove. The Environmental Coalition, in conjunction with the Ministry of Health and MINAET (Costa Rica’s environmental ministry), will be working on a way to address this issue. Summary of the waste collected. 190 kg is recyclable while 2.3 TONS is not. On Sunday September 12 we celebrated the Second Annual Osa Peninsula Sea Turtle Festival on Carate Beach. The objectives of this annual event are to raise community awareness about the importance of joint actions in the conservation of the sea turtle species that frequent the beaches of the Osa Peninsula in the months of nesting, and to share the objectives and results of Friends of the Osa’s Sea Turtle Conservation Program with the community. 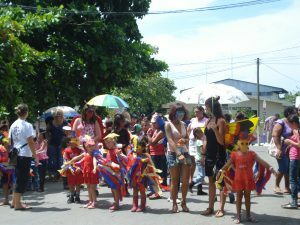 This year at least 120 people from the communities of Carate, Rio Oro, Piro, and Puerto Jimenez participated in the festival. Puerto Jimenez students presented the play, “Survival of the Sea Turtles,” which told of the dangers that sea turtles are exposed to from the moment they are born. Educational games were played with children in which they acted out different parts of the sea turtle nesting process and lifecycle. 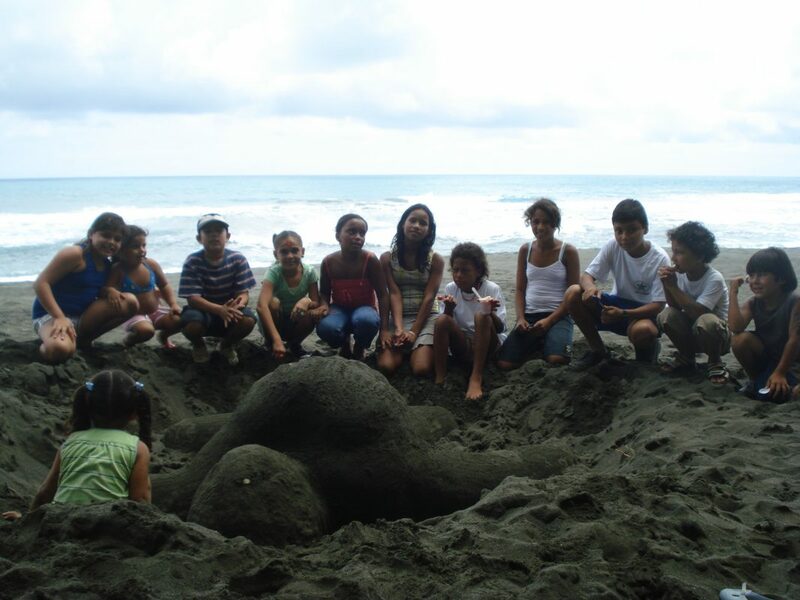 Younger children and their parents made sand sculptures of leatherbacks and adults participated in the presentation about the Sea Turtle Conservation Program Piro-Carate. We also announced the winners of the drawing contest “Survival of the Sea Turtles,” that was held with students from the Piro and Rio Oro schools. On this sunny day participants also played soccer, beach volleyball, sang karaoke and enjoyed a great picnic prepared by the community. Friends of the Osa’s Environmental Education program is carrying out educational activities on the conservation of sea turtles and marine ecosystems in the schools of the Osa Peninsula. 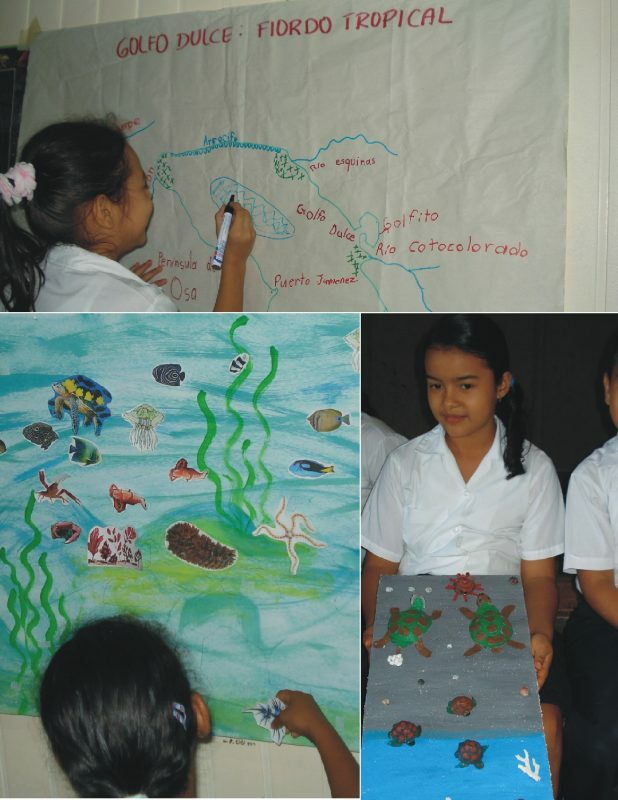 The objectives are for students to learn the importance of sea turtle conservation, why Golfo Dulce is a tropical fjord, and the ecological and scientific implications of this designation. Students learn about the four sea turtle species that nest every year on the beaches of the Osa Peninsula: Olive Ridley (Lepidochelys olivacea), East Pacific Green or black turtle (Chelonia mydas agassizii), Hawksbill (Eretmochelys imbricata) and Leatherback (Dermochelys coriacea). They also learn about the nesting process, migration, life cycle, threats and efforts being made in the conservation of these species. The topographical features of the Golfo Dulce, major ecosystems, both resident and non-resident species, such as humpback whales and the environmental impacts on ecosystems, are topics that are treated within the marine ecosystems program. This section of the Environmental Education program seeks to foster student interest in understanding this unexplored area within the school curriculum, which has traditionally focused only on terrestrial ecosystems. It’s really interesting for students to learn about species previously unknown to them, such as marine plankton, species that make aquatic ecosystems sustainable and contribute between 50-90% of the oxygen to the Earth’s atmosphere.